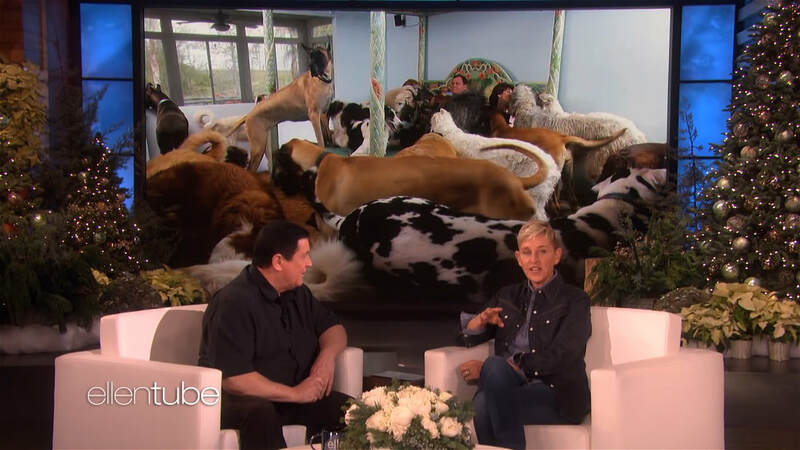 Watch Burt interviewed by Ellen on "The Ellen Show"
​Actor Burt Ward, best known for playing Robin in the 1960s "Batman" TV series, was praised by Ellen for his amazing efforts in rescuing dogs. Through his Gentle Giants Rescue and Adoptions organization, Burt and his wife have saved 15.500 dogs, and created a dog food line that doubles and sometimes triples a dog's lifespan. The absolutely incredible Burt Ward stopped by the show today to discuss Gentle Giants Rescue and Adoptions, the largest giant breed dog rescue in the world. The former "Batman" sidekick built a luxurious home for the more than 15,000 Gentle Giants and Little Giants that he and his wife Tracy have rescued and adopted during the last 24 years. Thanks to their very own World Class Canine Nutrition Dog Food, Gentle Giants are living up to 27 years! With over 600 pounds being fed to these amazing animals every day, the world of Gentle Giants is one of a kind! You can buy Gentle Giant's dog food in grocery stores everywhere, and at Walmart. To find out more about Gentle Giants and their dog food, click here! Remember, "Half the Price, and Twice the Life!" Ellen says, "Burt Ward, who played Robin on Batman, and his wife Tracy created this line of all-natural dog food and it's worked wonders for all different breeds. They've also saved over 15,000 dogs through Burt's Gentle Giants Rescue and Adoptions. For that, I love them." Burt on Fox Business News talks with Maria Bartiromo about dogs eating Gentle Giants Dog Food and following Gentle Giants Special Dog Food and Care Program. He also talks about where viewers can purchase Gentle Giants Dog Food locally where they live. This video gives a good overview and understanding of our Gentle Giants Dog Food, our Gentle Giants Philosophy, and our Gentle Giants Special Dog Food and Care Program. Everything that you need to know about our life's cause to help all dogs live the longest, healthiest, happiest lives possible. Gentle Giants Dog Food is excellent for all dogs of all ages, sizes, and stages of life - from 2 pounds to 300 pounds - from the youngest 3 1/2 week old puppies to the oldest seniors that are 27 years old. This video shows all of our products and ingredients, and explains how we intentionally made Gentle Giants Dog Food affordable, so that all dogs can benefit. Gentle Giants Dog Food retails for half the price of what natural dog foods sell in Pet stores. We love animals! Our pets are our family members! Emmy nominated On-air Host for CBS News, Erica Olsen, interviews Burt Ward about All Natural Gentle Giants Dog Food. Watch our video below to see how much fun it is to live with 45-50 Canine Kids! Slow Motion Footage: We want you to see the harmonious environment in which our dogs live with us in our home. Please watch how our Gentle Giants and Little Giants are as affectionate to us and to each other as we are to them. Notice how happy all the dogs are with their tails wagging continuously. See what it is like to be "sat on" by a 295lb giant English Mastiff! Watch a Saluki jump over our king size bed. Our 45-50 Gentle Giants and Little Giants Canine Kids live in our home with us! Celebrating Longer, Healthier, Happier Years With Our Canine Kids. We feed as much as 600lbs. of Natural Gentle Giants World Class Nutrition Dog Food with added Vitamins and Minerals to our rescue dogs EVERY DAY! Our dogs are WONDERFULLY HEALTHY. We teach our dogs to SELF-REGULATE how much they eat. Our dogs EAT ALL THEY WANT of Gentle Giants, but THEY DON'T OVEREAT AND THEY DON'T GAIN TOO MUCH WEIGHT! Read more on our website about our Gentle Giants Special Dog Food and Care Program. Gentle Giants World Class Canine Nutrition is EXCELLENT for all dog breeds at all life stages. Gentle Giants is the ONLY food that your dog needs for its entire lifetime, from the first bites as a puppy to the senior years. Online Locations: Gentle Giants Dog Food is available on Walmart.com, Chewy.com and Petsmart.com. Walmart.com: If you order from Walmart.com, they will ship it free of charge to your local Walmart store and will ship it to your home for a $5.00 shipping charge. We have decided to stop selling Gentle Giants Dog Food on Amazon.com because of their business practices. Gentle Giants Dog Food is also available now in Big Y Grocery Stores throughout MA, CT, and Maryland. Gentle Giants Dog Food will be available nationally in 1500 - 1750+ Walmart Supercenters this coming February 2018. Please let us know if you have any other questions, and we would love if everyone would send us photos and videos of how great your Canine Kids are doing eating our Gentle Giants Dog Food. Get your Gentle Giants Dog Food today!